Starting in August of 2015 to present date, I have partnered with Oakland University to lead film-making and animation classes for students in the OU CARES program. In these workshops I taught autistic students the theory behind film-making and helped them develop and create their own short films and animations. It has been rewarding watching them learn and grow. In 2016 to present date, I have partnered with Best Buy and Student Leadership Services . I led multiple workshops with the SLS students, so they could learn and become familiar with technology. Using the skills I taught them, the students made promotional videos that reflected the SLS values. I’m currently working asset protection for Best Buy. In late October 2013, I accepted a job with Grand Valley State University and relocated to Grand Rapids, MI. In my new position at the Grand Valley State University Simulation Center, I assisted with the management of all the audiovisual operations for the GVSU Simulation Center at the Cook-Devos Center for Health Sciences. I collaborated with the creation, production, and delivery of online lectures and other multi-media content for health professions students and faculty so they can stream events and watch recorded media online. I managed video operations in the Arcadia simulation database and provide technical support for the simulation labs when needed. I also created videos such as the one below to help promote the GVSU Simulation Center and other Office of the Vice Provost of Health programs. The video below was showed at the MIPERC conference on September 19, 2014 discussing the advantages of Interprofessional educational programs in the health care field. For more information on MIPERC please click here their website. On Season 13 of American Idol I worked three days as a Production Assistant on American Idol for the Detroit Audition Judges Round at the Westin Book Cadillac Hotel. On the first day, I helped load in the set and set up the production base camp. The remaining two days, it was my responsibility to ensure the Detroit finalists filled out the necessary paperwork, evaluations, and on camera interviews that were necessary for them to move on in the American Idol competition. On Season 14 of American Idol I worked as a Production Assistant for the Top 24 and Top 16 Semi Final shows. I helped with transportation of crew and contestants between the Westin Book Cadillac Hotel and the Fillmore Detroit. I assisted in various production tasks, and I suggested and helped filmed Detroit landmarks to be used as B-Roll for the show. One of the segments I helped produce is in the space below. The Summer Film Project was founded in 1995 by Grand Valley State University. It brings students, faculty and industry professionals together on the production of a film. The preproduction and filming takes place in the summer session. The fall semester is devoted to postproduction where students complete the film and prepare for its premiere at a local movie theatre and enter it into film festivals across the country. I worked on two of Grand Valley’s summer films The Darkroom and Horizontal Accidents. You are now able view these two films below. If you’d like more information on Grand Valley’s Summer Film Project click here. To view the other Summer Film Projects online click on the Vimeo page here. The Darkroom from GVSU Film/Video on Vimeo. Horizontal Accidents from GVSU Film/Video on Vimeo. I was a participant in the 2012 48 Hour Film Project: Detroit and this year I worked with BROBIEfilms. 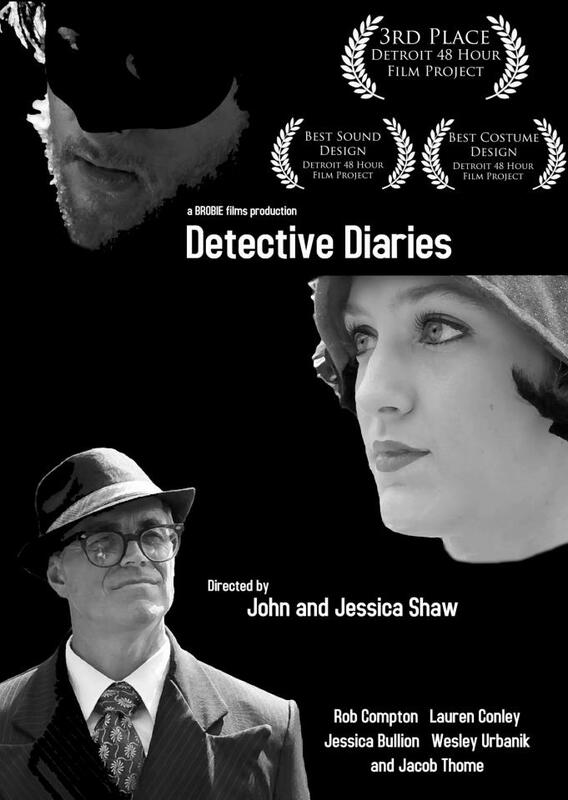 Our film “Detective Diaries” collected a total of three awards. We won 3rd Place Overall, along with Best Sound Design, and Best Costumes. My primary job on this project was the Assistant Editor. I transcoded footage, synched audio, organized footage, and put together a rough cut of the film to allow the director more time to film and to have an easier time editing. I also acted as boom operator/sound mixer for a small portion of the film shoot. I’m very proud of the work that I and the rest of BROBIEfilms team were able to accomplish in such a small period of time.